Just a few miles from the University of Southern California campus, Skid Row contains a significant portion of the homeless population of Los Angeles, a city in the midst of a declared state of emergency with nearly 47,000 people in total living in shelters and on the street. For R. Scott Mitchell and Sofia Borges, two instructors at the USC School of Architecture, this city-wide crisis demands an architectural response. “The homeless are always thinking about architecture. It’s time we started thinking about them,” they wrote in the syllabus for their course, Homeless Studio. The Homeless Studio was divided into two parts: a short charette on nomadic structures, followed by a fabrication workshop. During the first part, the students were tasked with developing a nomadic sleeping space around the size of a shopping cart, with a budget of just $500 for the entire project. For the second part, the students designed tiny homes entirely out of materials they scavenged, with the ultimate aim of redistributing them to homeless people. Finally, the students worked with a real-world client—the Hope of the Valley Rescue Mission—to design and build a 30-bed by-right shelter for senior women. “[Hope of the Valley Rescue Mission] CEO Ken Craft has become our client for the semester and we have been working closely with him, the Departments of Building and Safety, City Planning, and now the Mayor’s Office, to develop a city-supported modular, adaptable housing solution for immediate stabilization to get people off the streets until they can be placed in permanent supportive housing,” Borges explains. We got in touch with Mitchell via email to hear more about how the studio worked and the impetus for it. Homelessness is typically understood as a problem that pertains more to policy and government than architectural design. What was the initial motivation for the studio and what is it trying to achieve? It’s true that the problem is deeply rooted in policy and governmental issues. However, the situation in Los Angeles is compounded by the housing market and increasing population density. These added conditions fall into an area that architects are well equipped to handle. It’s doubtful that policy or architecture alone could do anything to directly alleviate the problem. Working together it seems that some positive steps are possible. The initial motivation for the studio came from the founders of Madworkshop, Mary and David Martin. Madworkshop reached out to USC School of Architecture with the hope that the students would be able to come up with some practical, creative and buildable solutions of homelessness in Los Angeles. What were the parameters of the prompt? The prompt was somewhat open initially. It was always housing, but we knew that it had to be something that could be accomplished in a very short design timeframe. The idea of emergency stabilization came up in our early conversations and it just continued from there. The concept is to get folks off the street and into a safe and secure shelter as rapidly as possible. These days architecture students rarely design anything that will actually be built. Did you find that students adapted well to the challenges of designing a building that is intended to be realized as a home? Yes, they adapted quickly. We were actually stunned at how fast they came up to speed. Bear in mind that these are 4th year students just coming out of three years of a set architectural curriculum. They were ready to be unleashed, so to speak, on a real world project. It might have been a relief to step away from the computer for a minute and build something. The idea of designing a “home” was never an issue as we were very clear about the client’s needs. They took to it quite readily. Likewise, most students design without material limitations in mind. Can you tell us a bit about the motivation to employ only salvaged materials? And the students response to this stipulation? Actually, this part needs some minor clarification. Before the final assignment the student groups worked on two initial homeless typological studies. 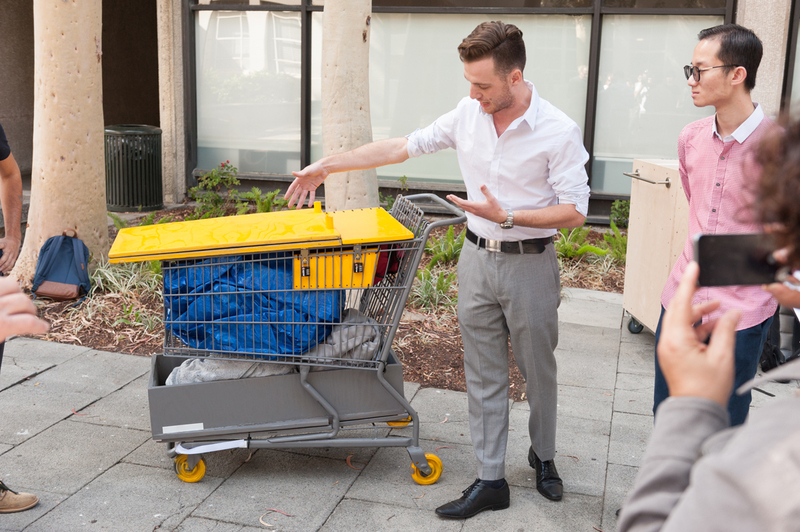 The first was a secure nomadic sleeping unit roughly based on the volume of a shopping cart. They had a material budget of $500 for the entire project. The second study was a tiny homes project. This was the exercise that employed only salvaged materials. The students scavenged for a weekend and spent the following four days building the small structures from their finds. Our only real expenditure was on casters, locks and fasteners. The motivation for this was to make them consider the idea of found materials and how people living on the street had to think about construction and shelter. They appeared to take the transition from new to found materials in stride. However, seeing that they only had a week to complete the built project they might not have had time to think about how difficult it might be. The final output of the course has been a much larger step for the students as the client and the city are now fully involved in the design process. Could you tell us a bit about a few of your favorite projects that came out of the course? It may sound diplomatic on my part, but I don’t think we’ve really chosen a favorite. The work they’ve been able to generate in the last twelve weeks has been incredible. I’ll admit that I look back on the first assignment as my technical favorite. Still amazed by how inventive they were with the nomadic shelters. What are some of the challenges you’ve encountered trying to get these structures in use? As in all architecture, the question of liability keeps coming up. We’ve had to be careful about how the units are distributed. It’s become more or less a blind system in that we’ve had to sign them over to a third party for distribution. The third-party, artist Gregory Kloehn, led the week-long building workshop that generated the tiny homes. All we can say is that they are out in world and serving their intended use. What do you see as the future of the program? There has been some internal discussion of us continuing with similar work in the fall of next year. The feedback has been great and the student interest is definitely there. Hopefully the funding will be.